The week of preserving the harvest wasn't really just a week. You know that, right? When you're preserving food, it's about the whole season. And the height of that season, in Portland, seems to be September. Just when I thought 37 lbs. of tomatoes was enough, we found a u-pick tomato field. A super secret, amazing place. The field has been here for years. But built up around it now, is industrial Portland. Completely surrounded. The only other people picking that early morning when we were there? Couples in their 60's. And 70's. They knew this place before the industrial park complexes surrounded it. AdRi read the sign posted on the barn door that said the u-pick tomatoes were 50 cents a lb. Surrounded by these beautiful tomatoes? She couldn't stop picking. "Just a few more." 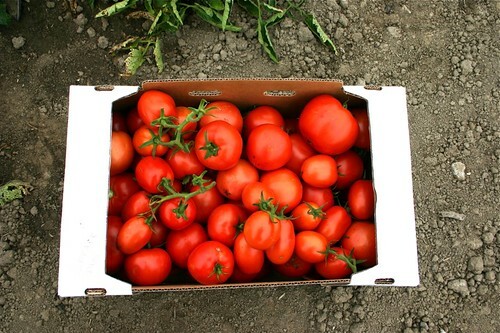 And the box became full of red beauties. I wandered with my camera. 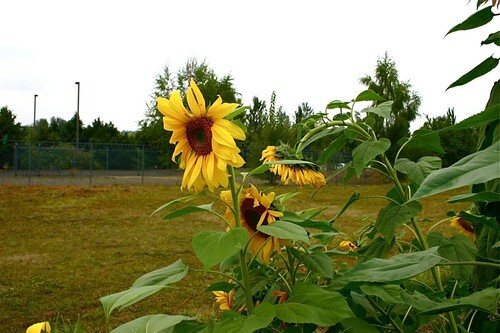 And admired the sunflowers in the strange setting. I could now blog about the chile sauce (thanks mom for sending my childhood favorite! ), BBQ sauce, tomato jam, and pear chutney we made and canned. I could. But I'm a little tired. And these photos here will have to do. But before I go, I wanted to let you know that this Thursday, I'll be on a local radio show here in Oregon, Think Out Loud, and will be speaking about, well, you guessed it, preserving the harvest. 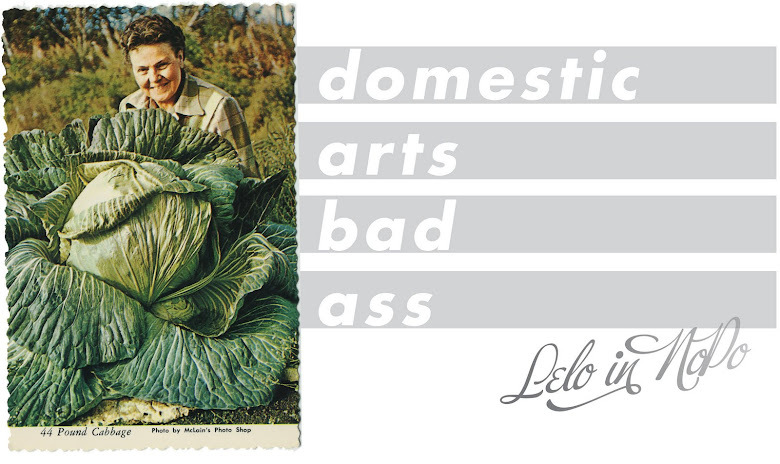 Listen in from 9-10am, 91.5 KOPB, for what I'm sure will be a great show about preserving food. (Looks like you'll also be able to listen to the show online afterwards, so I'll post a link to it then.) Update: you can read about the show here and comment ahead of time. Chime in and tell them what you're preserving! P.S. Thank you for all the kind comments on my last post about my friend, Rudy. For you to know, we walked today and talked about the economy. He's pissed off and asked the question, "Why is it always the little guy who gets stuck with this mess?" I wish I had a good answer to that. But if Rudy, at age 94, can still vote, so can you. Please make sure you're registered! OK. I'm crying "foul" here. You must reveal the tomato source. Well, so far only one of my tomatoes has started to turn red, so I have no idea if I'll ever get one that's ready to pick before the frost comes, much less one of those beauties you found! Heather: this year has been hard for many people's tomatoes. I'm hoping for warm weather and sunshine to ripen yours! 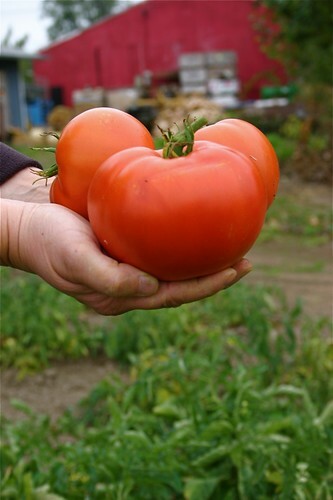 Mark: With all those beautiful tomatoes in your garden, you've got your hands full already! But I told you the secret place in person so you're set, just in case. Yum! I've noticed that the tomatoes didn't hit their stride until September this year. Not always the case (if memory serves), but I guess that weird cool summer we had explains it. But they're great now! Even my pathetic plants have produced some pretty darn tasty taters! I have had a million tomatoes but none of them, save the cherries, taste good. I've only eaten about five raw and the rest I've had to roast to bring out any flavor and get rid of the watery and mealy aspects. It's very sad. On the upside, the roasted tomatoes are great and freeze well! The cherries have been delicious and abundant and I've been so glad to have them. I went on a photo walk a few weeks ago and met a fellow that told me about a 'guerrilla gardening' project that he and another neighbor did. They find empty abandoned lots in some of the poorest neighborhoods in town, take them over, till them up and plant. Then they teach the people how to garden. I think it's a fantastic idea. 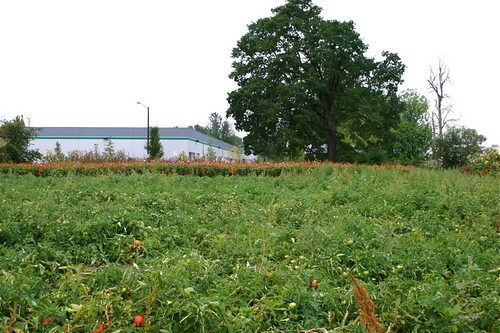 I'm trying so hard to find out the location of that u-pick tomato field in NoPo to no luck! I've scoured your nuts and bolts page but must be missing it. Any more hints on where that might be? Oh Emily, you are a good sport. I'm sorry I made you hunt for it like that. But you better hurry if you want any left: these rains may make it the last days of the tomatoes! Google "The Barn" Portland, and you'll find it. It's NE 148th near Marine Drive. Let me know if you go, okay?